Ayers Point is a 2-color (or more!) 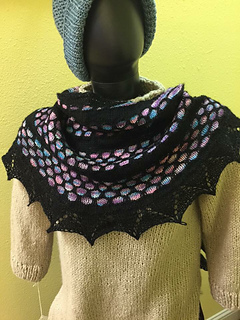 lightweight crescent-shaped shawl with a simple lace edge. At the suggestion of my dear husband, my original designs are named after towns, villages, and areas (both current and historical) near my childhood home. Ayers Point is the original name of the current village of Oakdale, where my dad spent most of his working years, until retirement. Size 5 (3.75mm) circular knitting needles, 32” or longer, or size needed to obtain gauge of approx. 32 rows & 24 stitches per 4 inches in stockinette (after blocking).